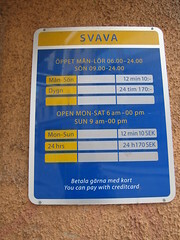 There are a number of Swedish time-related words which are derived from a two-word construction involving the preposition i (in). 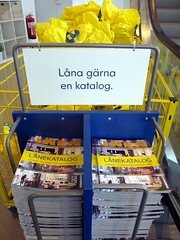 Examples are idag (today), igår (yesterday), ikväll (tonight), imorgon (tomorrow), and imorse (this morning). The adverb ibland (sometimes) is related: it is derived from i + bland (among). Hon säger att de aldrig träffas. She says that they never meet. Jag går aldrig på bio. Jag går på bio ibland. Han säger att han aldrig går på bio. Han säger att han går på bio ibland. I always/never/sometimes cycle to work. *Always/*Never/Sometimes I cycle to work. I cycle to work ?always/*never/sometimes. (Where the * means it’s ungrammatical for me, and the ? means it sounds odd; you may have a different opinion. You could also consider how often would fit into this pattern.) So, “crazy English language” also. On a lighter note, I just learned that the Swedish for the @ symbol is snabel-a, where snabel is trunk (of an elephant) or proboscis. Cute or what?